Park Lodge chef and owner Philip Stanton. Chef Philip Stanton is taking food back to the basics. He's starting with fire. The chef and owner of the newly opened Park Lodge on the western end of Spokane's Kendall Yards development has created a seasonal-driven eatery focused on wood-fire cooking techniques to develop complex, yet familiar, flavors that come from fresh ingredients, the smoke and the wood itself. Openly visible to diners from many vantage points in the airy dining room and bar is how this process comes to form: a large wood-burning hearth fitted with a wide metal grate that's lowered and raised using two large crank wheels. The rustic method is the focal point of Stanton's vision for Park Lodge. 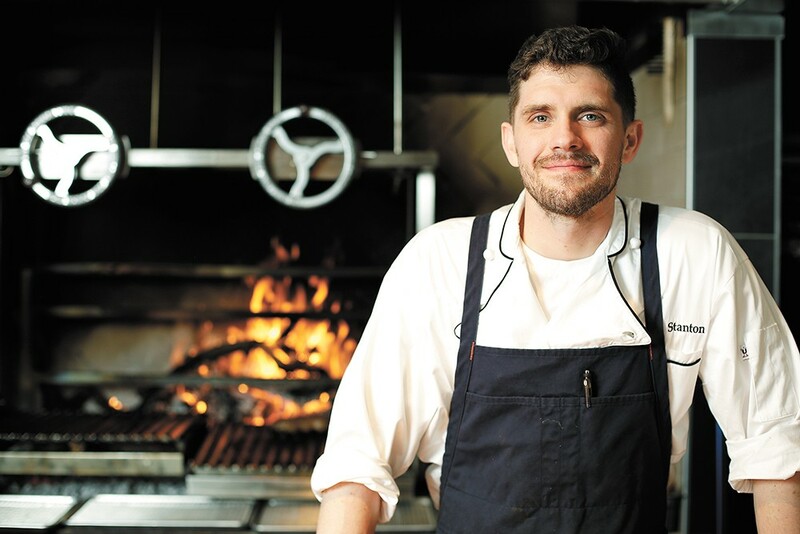 "The first time I saw this grill was at Ox [Restaurant] in Portland," the chef says. "The chefs there got the [James Beard] Best Chef Northwest Award, and I had a great meal there. I wanted to build the restaurant around that." Stanton and his culinary team use the applewood-burning hearth to grill meat and some vegetables over an open flame. Small brick nooks placed along one side of the hearth also allow for indirect cooking. "I love cooking with real fire — not even the coals, but the wood in its raw state," Stanton explains. "As it breaks down, there are so many flavors that happen. When you're just cooking with a gas grill, there is no real flavor development. "I think back to the times people were building fires in the corner of their castles and sticking meat on it — going back to that, and presenting it in a new, clean atmosphere and keeping up-to-date with modern techniques." 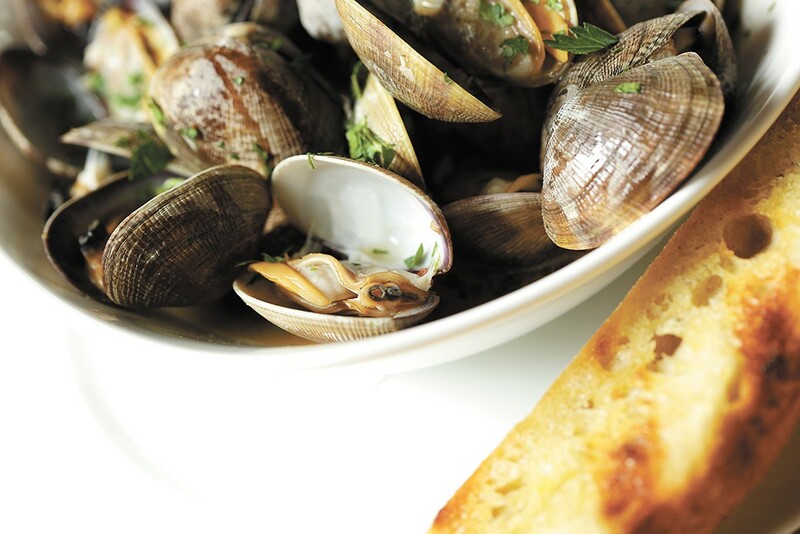 Park Lodge's menu features many familiar dishes, like steamed Manila clams. The Park Lodge kitchen hearth was custom built by a company out of Washington D.C., and as far as Stanton knows, his is one of only a few restaurants in the area currently using this type of wood-fired grill for most of its preparations. "I never got to cook over fire in a professional setting," he notes. "I've always loved grilling and being around fire. ... When you're cooking with a pulldown grill, that is where the most delicious meals have come from in my life." Beyond the flavors imparted by an open flame, Stanton has a deep reverence for cooking with regional, in-season ingredients. "People go to the store and think a tomato is a tomato — but dishes are affected by sugar, freshness and if it's in season and grown in proper environments and temperatures," he explains. "I just buy the produce and stock the kitchen and come up with the menu off that." With that in mind, diners can expect to see frequent menu changes, chef's specials and other decisions that highlight what Stanton is able to procure locally. He specifically mentions a leek farmer in Deer Park who he only knows by first name. Also expect that some items on Park Lodge's refined menu — currently focused on what Stanton describes as "locally inspired American comfort food" with a Mediterranean influence — will showcase unusual presentations for familiar dishes. "So it's chili — it's beans and meat cooked in a chili sauce, but I'm transforming it and making it my own, and doing something that reflects my experience with cooking," Stanton says. Beyond the chef's takes on traditional surf, turf and plant-based entrees — roast duck breast ($27), prime New York strip steak ($38), potato-crusted halibut ($34), beef tenderloin ($44/$60) a seven-vegetable tagine ($21) and more — the Park Lodge burger ($16) with onion bacon jam, gruyere, green peppercorn aioli and arugula, will also appeal to traditionalists' eyes and stomachs. "It'll feel familiar and taste familiar, but look like something special and different," Stanton explains of the restaurant's more creative offerings. "But some stuff... the steaks look like steak and fries, but cooked over a wood fire." Stanton, 32, got his culinary start like many do; at the bottom of the heap, washing dishes at a Denny's in Pullman. "I jumped into the kitchen because it seemed like it was fun," he recalls. "I learned how to take it and turn it into something where you're a professional, and it's not just something you're doing for fun — you're learning a craft and applying yourself to finding a perfect end result of something." Early on in his career, Stanton worked at many esteemed restaurants in San Francisco (La Folie), Portland (Bluehour, Castagna) and Paris (Le Relais Louis XIII) after graduating from the California Culinary Academy. For the past three years, after moving back home to Spokane from Portland with his wife, Helen, Stanton was sous chef at Italia Trattoria in Browne's Addition. "There is a lot of talent in Portland, but they don't have a sustainable restaurant scene," he notes. "I think Spokane has a good market for fine dining. We've traditionally been a city that's a little more into fast-casual type food and pub food, and I think people are starting to want to go back to having a nice dinner with fresh veggies and meat, and not a ton of processed product." Park Lodge is currently only open for dinner, starting with an abbreviated happy hour menu from 4-5 pm. The restaurant, across the street from Kendall Yards' Olmsted Green Park, overlooks the Centennial Trail and the Spokane River gorge. Stanton worked with Kendall Yards' developer Greenstone to secure the space, a building that Park Lodge shares with a forthcoming location of Indaba Coffee Roasters and the new Hello Sugar doughnut shop. Seating on a large patio overlooking the river isn't open yet. Stanton plans to also build a fire pit in one corner that he hopes can also function as a rotisserie during special events. The original print version of this article was headlined "Fire and Smoke"